Learn about the various temperature scales that are commonly used in chemistry. Define density and use it as a conversion factor. There are other units in chemistry that are important, and we will cover others in the course of the entire book. One of the fundamental quantities in science is temperature. Temperature is a measure of the average amount of energy of motion, or kinetic energy, a system contains. Temperatures are expressed using scales that use units called degrees, and there are several temperature scales in use. In the United States, the commonly used temperature scale is the Fahrenheit scale (symbolized by °F and spoken as “degrees Fahrenheit”). On this scale, the freezing point of liquid water (the temperature at which liquid water turns to solid ice) is 32 °F, and the boiling point of water (the temperature at which liquid water turns to steam) is 212 °F. Using these formulas, we can convert from one temperature scale to another. The number 32 in the formulas is exact and does not count in significant figure determination. What is 98.6 °F in degrees Celsius? What is 25.0 °C in degrees Fahrenheit? Convert 0 °F to degrees Celsius. Convert 212 °C to degrees Fahrenheit. The reason that the Kelvin scale is defined this way is because there exists a minimum possible temperature called absolute zero. The Kelvin temperature scale is set so that 0 K is absolute zero, and temperature is counted upward from there. Normal room temperature is about 295 K, as seen in the following example. If normal room temperature is 72.0 °F, what is room temperature in degrees Celsius and kelvins? So, room temperature is about 295 K.
What is 98.6 °F on the Kelvin scale? 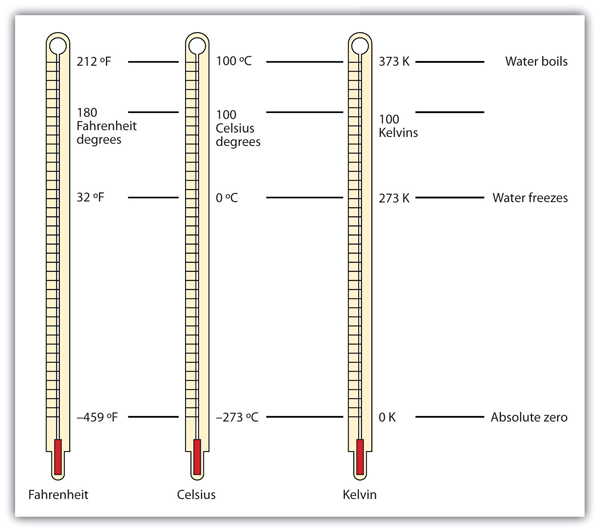 Figure 2.9 “Fahrenheit, Celsius, and Kelvin Temperatures” compares the three temperature scales. Note that science uses the Celsius and Kelvin scales almost exclusively; virtually no practicing chemist expresses laboratory-measured temperatures with the Fahrenheit scale. (In fact, the United States is one of the few countries in the world that still uses the Fahrenheit scale on a daily basis. The other two countries are Liberia and Myanmar [formerly Burma]. A comparison of the three temperature scales. Density is usually a measured property of a substance, so its numerical value affects the significant figures in a calculation. Notice that density is defined in terms of two dissimilar units, mass and volume. That means that density overall has derived units, just like velocity. Common units for density include g/mL, g/cm3, g/L, kg/L, and even kg/m3. Densities for some common substances are listed in Table 2.2 “Densities of Some Common Substances”. where we have limited our answer to two significant figures. What is the mass of 44.6 mL of mercury? The mass of the mercury is 607 g.
What is the mass of 25.0 cm3 of iron? Note how the mass units cancel, leaving the volume unit, which is what we’re looking for. A cork stopper from a bottle of wine has a mass of 3.78 g. If the density of cork is 0.22 g/cm3, what is the volume of the cork? What is the volume of 3.78 g of gold? Care must be used with density as a conversion factor. Make sure the mass units are the same, or the volume units are the same, before using density to convert to a different unit. Often, the unit of the given quantity must be first converted to the appropriate unit before applying density as a conversion factor. Because degrees Fahrenheit is the common temperature scale in the United States, kitchen appliances, such as ovens, are calibrated in that scale. A cool oven may be only 150°F, while a cake may be baked at 350°F and a chicken roasted at 400°F. The broil setting on many ovens is 500°F, which is typically the highest temperature setting on a household oven. People who live at high altitudes, typically 2,000 ft above sea level or higher, are sometimes urged to use slightly different cooking instructions on some products, such as cakes and bread, because water boils at a lower temperature the higher in altitude you go, meaning that foods cook slower. For example, in Cleveland water typically boils at 212°F (100°C), but in Denver, the Mile-High City, water boils at about 200°F (93.3°C), which can significantly lengthen cooking times. Good cooks need to be aware of this. Other countries use the Celsius scale for everyday purposes. Therefore, oven dials in their kitchens are marked in degrees Celsius. It can be confusing for US cooks to use ovens abroad—a 425°F oven in the United States is equivalent to a 220°C oven in other countries. These days, many oven thermometers are marked with both temperature scales. Chemistry uses the Celsius and Kelvin scales to express temperatures. A temperature on the Kelvin scale is the Celsius temperature plus 273.15. The minimum possible temperature is absolute zero and is assigned 0 K on the Kelvin scale. Density relates a substance’s mass and volume. Density can be used to calculate volume from a given mass or mass from a given volume. 2. Perform the following conversions. 5. Convert 0 K to degrees Celsius. What is the significance of the temperature in degrees Celsius? 6. Convert 0 K to degrees Fahrenheit. What is the significance of the temperature in degrees Fahrenheit? 7. The hottest temperature ever recorded on the surface of the earth was 136°F in Libya in 1922. What is the temperature in degrees Celsius and in kelvins? 8. The coldest temperature ever recorded on the surface of the earth was −128.6°F in Vostok, Antarctica, in 1983. What is the temperature in degrees Celsius and in kelvins? 9. Give at least three possible units for density. 10. What are the units when density is inverted? Give three examples. 11. A sample of iron has a volume of 48.2 cm3. What is its mass? 12. A sample of air has a volume of 1,015 mL. What is its mass? 13. The volume of hydrogen used by the Hindenburg, the German airship that exploded in New Jersey in 1937, was 2.000 × 108 L. If hydrogen gas has a density of 0.0899 g/L, what mass of hydrogen was used by the airship? 14. The volume of an Olympic-sized swimming pool is 2.50 × 109 cm3. If the pool is filled with alcohol (d = 0.789 g/cm3), what mass of alcohol is in the pool? 15. A typical engagement ring has 0.77 cm3 of gold. What mass of gold is present? 16. A typical mercury thermometer has 0.039 mL of mercury in it. What mass of mercury is in the thermometer? 17. What is the volume of 100.0 g of lead if lead has a density of 11.34 g/cm3? 18. What is the volume of 255.0 g of uranium if uranium has a density of 19.05 g/cm3? 19. What is the volume in liters of 222 g of neon if neon has a density of 0.900 g/L? 20. What is the volume in liters of 20.5 g of sulfur hexafluoride if sulfur hexafluoride has a density of 6.164 g/L? 21. Which has the greater volume, 100.0 g of iron (d = 7.87 g/cm3) or 75.0 g of gold (d = 19.3 g/cm3)? 22. Which has the greater volume, 100.0 g of hydrogen gas (d = 0.0000899 g/cm3) or 25.0 g of argon gas (d = 0.00178 g/cm3)? The 100.0 g of iron has the greater volume. Other Units: Temperature and Density by Jessie A. Key is licensed under a Creative Commons Attribution-NonCommercial-ShareAlike 4.0 International License, except where otherwise noted.